I have written on this issue before, but I think it is a very intriguing argument which gets too little attention, so I want to lay it out again with a slightly different emphasis. Now, for the Christian reader, I’m well aware that I’m not actually proving anything here; this argument is merely intended to punch one more small hole in the “logic” of Christianity. “In religion, a prophet, from the Greek word προφήτης (profétés) meaning 'advocate,' is an individual who is claimed to have been contacted by the supernatural or the divine, and to speak for them, serving as an intermediary with humanity” (from Wikipedia). The first thing to understand is that gods, by necessity, never actually show themselves to all the people of a tribe, or nation, or the world. It seems gods always choose the prophet system, where just one or a very few people receive the revelation and then spread the word to others. For example, according to the Jews, there were several prophets, including Abraham, Moses, Isaiah, Ezekiel, and a few others. It was only to them that god revealed himself. He left it to them to get the word to the rest of the people. As far as anyone knows, all other gods of prehistoric and historic times have likewise depended on the prophet system to reveal themselves and their commands, including the gods of the ancient cave dwellers, the Aztecs, Inca, American Indians, Norse, Sumerians, Babylonians, Egyptians, Greeks, Romans, and many other cultures. After all, if any of those “gods” actually showed themselves, then people would soon figure out that they weren’t real gods. Invisibility is invaluable to false gods; they can’t survive without it. According to Christian teaching, Jesus Christ is the principal prophet of the invisible Bible-god, who chose Christ to receive his revelation and then spread the message of his existence and his desires. Paul also claimed to have received revelations and may even have been more influential in developing Christian dogma. Now, consider all those gods of the cultures listed above – the Aztecs, Egyptians, Greeks, etc. I think anyone reading this will agree that they were all false gods, as were the thousands of other gods which have been recognized throughout history (exempting, for the moment, the god of the Christians). Now think about this. The fact that thousands of prophets have claimed to receive thousands of revelations from thousands of gods absolutely proves, beyond a shadow of a doubt, that the prophet system has been a complete failure throughout human history. Please, let that sink in. History has shown, unequivocally, that we humans are simply unable to tell a real prophet from a phony one. The proof is in the pudding; if we could tell the difference, we would not have followed thousands of false prophets and false gods. The fact that thousands of prophets have claimed to receive thousands of revelations from thousands of gods absolutely proves, beyond a shadow of a doubt, that the prophet system has been a complete failure throughout human history.So, when I say that the prophet system doesn’t work, I mean that it doesn’t work because it produces far too many false positives. If a medical test for diabetes was positive for 95% of the population, then it would be useless, since it produced too many false positives. (Only about 8% of the US population actually has diabetes). Now, if the Christian god really wanted to reveal his existence and his desires to us humans, would he have chosen this same flawed prophet system to do it? Would he have chosen the same system that has proposed the existence of thousands of false gods, and then succeeded in convincing billions of people that those gods were real? 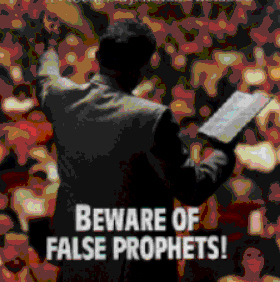 Wouldn’t a real god know enough about human psychology to know that the prophet system does not work, that we humans are hopeless at discerning real gods from phonies – and that we have made the same mistake over and over and over in believing false prophets about false gods? Since the prophet system has failed thousands of times to identify the real god (if there is one), why on earth should I – or anyone else - believe that it is working this time, for the Christians? And wouldn’t a real god, the supreme intelligence of the universe, be able to find a better way to reveal himself and his desires – a way that stood out, a way that provided testable proof, a way that actually worked? Christ the prophet supposedly got his revelation two thousand years ago and began to spread the word. And now, after all this time, less than a third of the world’s population are Christians, and it appears that Islam, Hinduism, and Buddhism may all be growing faster. Clearly, the prophet system has not worked well for Christianity either. Shouldn’t a real god, a being of supreme intelligence and the creator of humans, have been able to foresee this? This is one more reason why I do not believe in Bible-god. I do not believe that a real god would choose the prophet system to reveal his existence, a system which has failed over and over. Even a relatively stupid god should have been able to foresee that his chosen prophet would have to compete with thousands of other alleged prophets to convince us humans – who, it must be said, are infinitely gullible when it comes to religion, as history has proven through its thousands of false religions. I am convinced that Jesus, if he existed at all, was deluded or dishonest, and that he was no more a representative of a real god than the thousands of other “prophets” who made similar claims. You see, the prophet system depends on an exclusive revelation, and the obvious weakness of a revelation is that it can’t be tested. It is hearsay “evidence.” You have to take someone’s word for it, that it actually happened, and humans have jumped to the opportunity to do so – to many false revelations – over and over for thousands of years. The revelation approach to “knowledge” of a god has failed far too many times to be taken seriously by intelligent men and women, and no sane, intelligent god would expect you to fall for that same old trick again. I mean, really, wouldn’t a real god use a method that actually worked to get the word out – a method we could test, to avoid getting duped again - if for no other reason than to prove that he has a bit more imagination than all those thousands of phony gods people have worshiped?